Advance care planning conversations have not yet become a routine part of healthcare. The challenges inherent in conducting these conversations, the skills required to facilitate advance care planning conversations efficiently, and (until very recently) the lack of reimbursement are just some of the barriers. The comfort and ease with which patients, community members, cultural groups and providers are able to discuss or consider serious illness or death for themselves or a loved one varies widely. 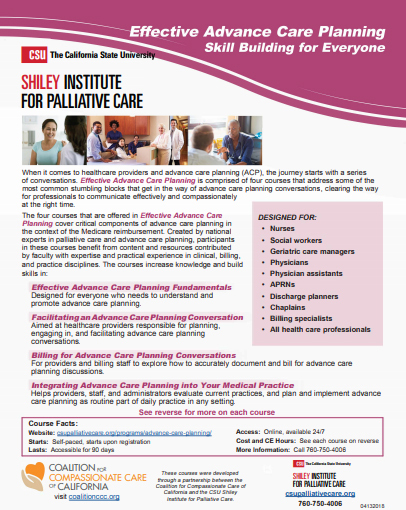 The Coalition for Compassionate Care of California in partnership with The California State University Institute for Palliative Care created Facilitating an Advance Care Planning Conversation to help practitioners develop and practice the skills needed to initiate and facilitate an advance care planning conversation. Advance care planning conversations need to be grounded in the personal beliefs, unique culture and life values of the individual doing the planning. Focusing on personal goals and values allows us to discuss outcomes that are meaningful to the patient and to help them choose treatments or care plans that support that focus. Throughout this course participants will learn skills needed to conduct advance care planning discussions from a person-centered perspective. 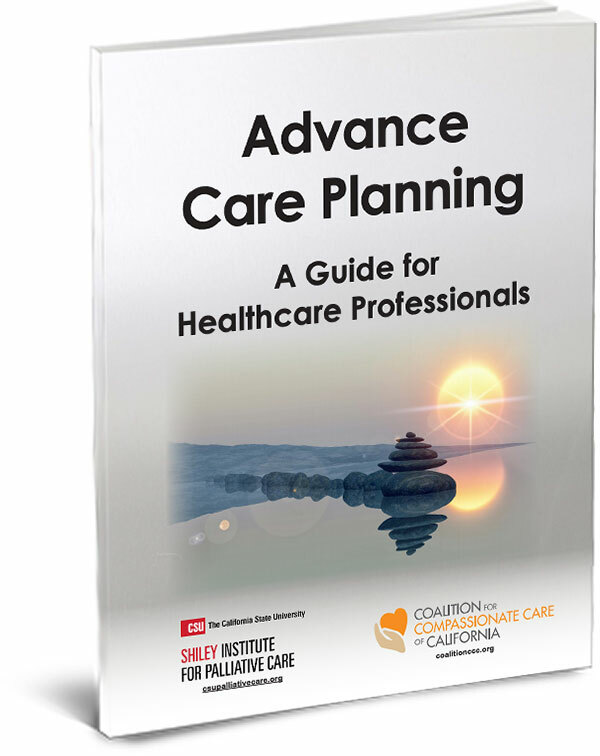 Strategies for promoting advance care planning to people at varying stages of life are explored so that the practitioner can engage healthy patients as well as those living with a chronic or serious illness. Given the interested in and emerging access to physician assisted suicide, the course explores potential responses to patients who express an interest in a hastened death. Case vignettes are presented to allow the participant to simulate the experience of starting a conversation, engaging family members, and overcoming barriers discovered during the advance care planning process.